For the DJX this expiry it was all about 23400, which we have covered at great length in previous articles, but once over that hurdle and into its Y ratio bandwidth we mentioned two other hurdles in its way. “We call them “step-ups” and here there are two in this mammoth Y ratio bandwidth, at 23800 and 24100”. As yesterday’s intraday high was 24099 it is this second one that has caught our attention. Today is the day of course, and the SPX being anywhere in the vicinity of 2600 is job done to us, which leaves the DJX quite a bit shy of theirs. Now, the problem with getting over 23400 certainly held this index back, thereby increasing the disparity. Furthermore, it is in Y ratio, so not that painful, but 24100 is quite a hurdle, and once the SPX has had its way our fear is that this index may look towards somewhere circa 23600 as the next cheapest alternative to expire around come Friday. As we have all expiry, we still feel the DJX is the kingmaker, so it will be the one to watch right to the end for sure. To be fair this is now becoming bit of a theme, the Feb DJX being like the FTSE and SPX with little or no ratio in situ at this moment in time. Intermediary to intermediary or not this is unusual. Pointless to speculate why, it may be for different reasons in each market, or everyone could simply be heading for the hills, and we don’t mean to go skiing, we just see the end result. The fact that the Y1 ratio bandwidth here stretches for 3700-points is bad enough, but this is not the entire story. Basically, the zone (zero ratio) could be from 23400 all the way up to 24600. So huge potential for extreme volatility and whipsaw. This, for you, may be a good thing of course. If the market blasts north no doubt the politicians will take full advantage, but make no mistake, this index is very vulnerable with no ratio to support it. If it skids down to 23400, we rather doubt the seriously minimal Y1 will have much, if any, impact, and if it then carries on to 22900, will R1 be enough? 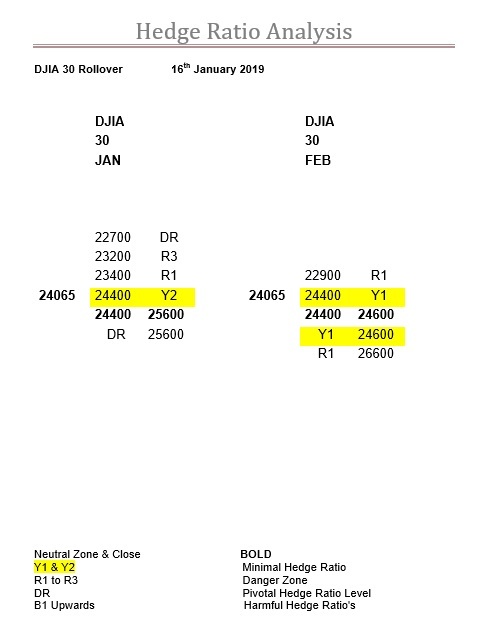 SPX Jan to Feb rollover, not a pretty sight, table, levels and comment.